The American Society of Plant Taxonomists (ASPT) has selected Dr. Vicki Funk as its 2018 Asa Gray Award recipient. 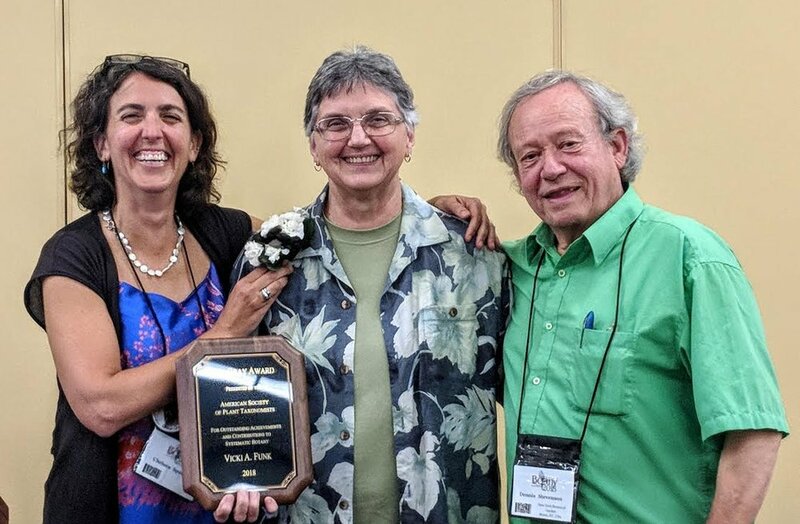 The prestigious award—named after arguably the most influential North American Botanist of the 19th Century—recognizes lifetime achievement in plant systematics. Indeed, the hallmarks of Funk’s career are noteworthy, including more than 200 peer-reviewed papers and as an editor/author on nine collaborative books. Some of these include Compositae: Systematics, Evolution, and Biogeography of the Compositae (2009) a prominent tome that brought together virtually all the researchers of the world’s largest plant family. The book was the winner of the prestigious Stebbins Medal, demonstrating its high international praise. Funk has also produced many seminal papers on topics such as phylogenetic patterns and hybridization (1985), the highly regarded how-to book The Compleat Cladist (1991), systematic data in biodiversity studies (2002), and the first book using modern phylogenetic approaches in a standardized way to address biogeography on oceanic islands (Hawaiian Biogeography, 1995). For all of the nominators, it is clear that Funk’s name is not only synonymous with Island Biogeography, but her momentous work has also systematically built the foundations on which many plant researcher’s careers have flourished. Funk’s humility is mentioned time and time again in her letters of support. Her tireless dedication and passion to the field is clearly evident. Her outstanding accomplishments, which are pertinent to the goals of ASPT, are indisputable. Throughout her career, Funk has mentored over 40 undergraduate, graduate, and post-doctoral students and has served as an un-official mentor to countless other interns, students, and postdocs. Funk has an outstanding track of service work serving as president of four major biological societies [Society for Systematic Biologists (1998-1999), International Biogeography Society, Founding Member and President (2007-2009), American Society of Plant Taxonomists (2006-2007), and International Association of Plant Taxonomists (2011-2017)] and has completed major service contributions at the Smithsonian. Additionally, she has made other significant editorial contributions, served on numerous review panels (including NSF, which she herself cannot apply for funding), is a frequent and avid speaker at workshops and conferences, has collected in excess of 13,000 herbarium specimens, and has organized a large number of symposia and other events. A native of Kentucky, USA, Dr. Funk received her B.S. in Biology and History (1969) and then a M.Sc. in Biology (1975) at Murray State University in 1969. Funk then completed a Ph.D. in 1980 at Ohio State University where she researched the systematics of Montanoa (Compositae) followed by a postdoctoral position at NYBG from 1980-1981. From 1981 to present, Funk has been a research scientist and curator at the U.S. National Herbarium, Department of Botany, National Museum of Natural History, Smithsonian Institution.